White water paddling is what we’re famous for! We operate our adventure tours and packages year-round. You choose your own level of fun with tours designed for your level of paddling experience: beginners, intermediate and advanced. There are half-day, one-day and two-day options. Our guided white water paddling tours on the Barrington River include an experienced guide to help make the most of your adventure plus transport, boat, paddle, spray deck, helmet and buoyancy vest. Subject to availability and minimum participants, guided tours depart every weekend throughout the year plus midweek during every school holiday period. Bookings are essential. You can also book other midweek dates, call us to find out. Departing 9.00am and 12.30pm daily. You’ll spend about 2 hours paddling on the water. This guided paddle from Rocky Crossing offers an easy 6km adventure on this lower section of the Barrington River with a good section for families in canoes and beginners in kayaks. There are long sections of gently flowing water separated with Grade 1 rapids that can be easily traversed with suitable care. Great for your first taste of white water and makes a perfect family outing. Your kids will love the names of the rapids they will master: The Root Ball, Willow Curtains, The Graveyard, The Drop and The Hook. Jump in a one-person kayak or two-person canoe. Family canoeing half day tour Our two-person Canadian canoes are perfect for a family paddling adventure that’s easy and fun! You’ll paddle the beginner’s section down from Rocky Crossing and includes a guide, equipment and transport. (Minimum age in a canoe is 8 years with one accompanying adult, or 6 years with two accompanying adults. ) And you’ll save money too with the special family pricing. This guided paddle offers fun adventure for more confident paddlers on the middle section of the Barrington River and finishes at the picturesque rapids called The Steps . Paddling 6km, there are good sections for beginners with calm flowing water plus sections to practice your control in eddys and rock gardens. You’ll enjoy Grade 1 or Grade 2 rapids for real white water experiences and you’ll soon be bragging about mastering Morning Glory, The Meaning of Life, Sharks Tooth, The Wave and The Steps. Departing 9.00am daily. You’ll spend about 4 hours white water paddling but split by a riverside lunch. These one day tours are Eco Tourism Certified to inspire environmentally sustainable and culturally responsible tourism. Starting at Rocky Crossing this guided paddle offers an easy 9km adventure on this lower section of the Barrington River with a good section for families in canoes and beginners in kayaks. There are long sections of gently flowing water separated with Grade 1 rapids that can be easily traversed with suitable care. Great for your first taste of white water and makes a perfect family outing. Your kids will love the names of the rapids they will master: The Root Ball, Willow Curtains, The Graveyard, The Drop, The Hook and The Wardrobe. Our most popular guided tour on the middle section of the Barrington River includes a riverside barbecue lunch at The Steps rapids and finishes at Rocky Crossing. Paddling 12km, you’ll enjoy Grade 1 and Grade 2 rapids for real white water experiences and you’ll soon be bragging about mastering The Meaning of Life, Sharks Tooth, The Wave and The Steps. After lunch you’ll take on Highway To A Hard Place, The Plug Hole and The Skull & Crossbones. Challenging yet fun, it’s an unforgettable day out! For more experienced kayakers only, this remote location starts at Cobark Junction and offers some spectacular scenery along the upper section of the Barrington River. The 12km paddle offers variable water conditions, gorges, river hazards, gravel races and Grade 2 and 3 rapids ensure you’ll use all your paddling skills on this adventure. Test your kayaking expertise on The Chute, Three-In-A-Bed, the infamous Washing Machine and more! Combine both One Day Tours for a true Barrington River adventure. After the first day of white water action from Bindera to Rocky Crossing, you’ll enjoy a BBQ dinner and camping at The Steps Campground. (You may also choose bunkhouse-style accommodation in Gloucester with a comfortable lounge, outdoor verandah and walking distance to the pub.) After breakfast on the second day you’ll face the trickier parts of the river from Cobark Junction to Bindera. This two day tour is Eco Tourism Certified to inspire environmentally sustainable and culturally responsible tourism. Departs 9.00am* and icludes an experienced guide, equipment plus transport. When the Barrington River is swollen from recent rains and is too high for kayaking, jump aboard a rafting tour for some high-water adventure. You’ll love the thrill of the white water highway! * Departures are determined by safe river levels for rafting and cannot be guaranteed. 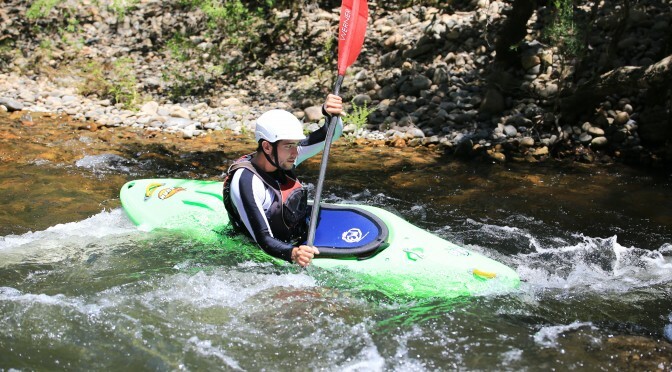 The ultimate adventure holiday for Barrington Tops with white water paddling, combining a one day kayaking tour with another day mountain biking. You’ll camp overnight at The Steps Campground (or you can choose bunkhouse-style accommodation in Gloucester with a comfortable lounge, outdoor verandah and walking distance to the pub.) We’ll prepare beautiful meals and your guide will be on hand at all times to ensure an unforgettable two days. Includes an experienced guide, equipment plus transport. This two day tour is Eco Tourism Certified to inspire environmentally sustainable and culturally responsible tourism.